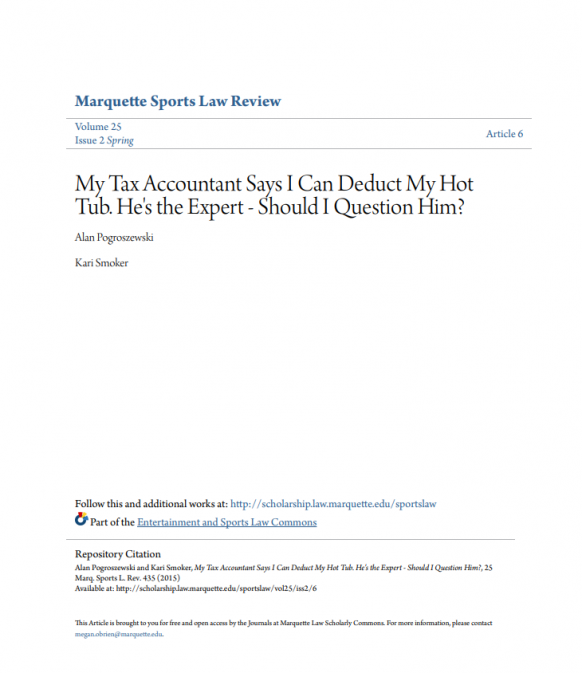 AFP Consulting, LLC - Jock Tax Professionals | My Tax Accountant Says I can Deduct My Hot Tub. He's The Expert – Should I Question Him? Authors Alan Pogroszewski and Kari Smoker examined this very question in their recent law review article and conclude that you should believe them. In November 2010, former Los Angeles Laker, Lamar Odom, sued the Internal Revenue Service (IRS) because it disallowed tax deductions of $12,000 in sports fines and another $178,000 in conditioning expenses. In February 2014, Kevin Durant, the National Basketball Association’s (NBA) Most Valuable Player (MVP) of the year, sued his tax accountant in a San Jose federal court for professional negligence and breach of fiduciary duty for deducting expenses for both personal travel and a personal chef on his corporate tax returns. Odom and Durant are high profile employees in a multibillion-dollar sports industry. Playing sports is their business, and they are entitled to certain tax deductions for their business expenses. However, the kinds of expenses that are tax-deductible business expenses, the circumstances under which they are deductible, and the tax accountant’s responsibility to his or her client in claiming these deductions has provided a hotbed for litigation between professional athletes claiming those deductions, their tax accountants, and the IRS.